Teenage lads lurking on the recreation ground: much less scary than when in hoodies and baseball caps. Under ancient village law a proposal to ban wearing the niqab within the boundaries of Harold resulted in everyone wearing one. The woman whose wearing of the niqab ultimately caused everyone to do the same says that she is amazed and humbled by her new neighbours’ attitude. 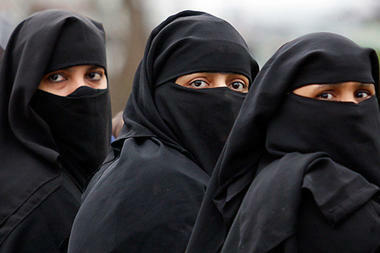 While most villagers have now reverted to their usual manners of dress some are reluctant to give up their niqabs.